GATA1 from other species may also be detectable. 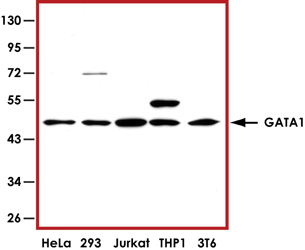 Sample Data :Representative Western blot with Anti-GATA1 (1:1000) using 20 μg of Hela, 293, Jurkat, THP1 and 3T6 cell lysate. Scientific Background :GATA1 is a member of the GATA family of transcription factors and plays an important role in erythroid development by regulating the switch of fetal hemoglobin to adult hemoglobin. FOG, a zinc finger protein, interacts with the amino (N) finger of GATA1 and this interaction is essential for the function of GATA1 in erythroid differentiation (1). Caspase-mediated cleavage of GATA1 is an important negative control mechanism in erythropoiesis. Mutations in GATA1 have been associated with X-linked dyserythropoietic anemia and thrombocytopenia. 1. Crispino, J D. et al: Use of altered specificity mutants to probe a specific protein-protein interaction in differentiation: the GATA-1:FOG complex. Molec. Cell 3: 219-228, 1999.